Yes, it's true. I'm not as enamoured with Martin Scorsese's ‘kids’ film and multiple Oscar nominee as most others. Firstly, it's not really a kids film at all. It’s a warm-hearted whimsical fantasy for sure, but it’s something more directly related to the Jean-Pierre Jeunet/Terry Gilliam/Baz Luhrmann adult magic realism. While there's a strong emotional core to this picture, that being the reclamation of spirit of turn-of-the-century filmmaker Georges Méliès through the journey of its young hero Hugo Cabret, the film is also overloaded with visual paraphernalia, which actually feels more derivative (of said filmmakers above) than fresh or unique to Scorsese. The opening act seems to show off the production design and special effects. Unfortunately, the frames are too busy for the film’s own good. The CGI-enhanced compositions are overloaded with wide-angle imagery, leaving everything in focus and confusing our eye. I'm also put off by the 'three-strip colour process' visual design of Robert Richardson's lighting (the same look as The Aviator), which means everything seems to have a distracting teal coloured tint. But this is all surface gloss. The guts of the story are fascinating. However, it really doesn't kick in until the halfway mark with a brilliant mid-point turn (admirably hidden to audiences in its marketing push), which sends the film in a whole new direction. In fact, it’s essentially a two-act film, cleaved in half by the reveal of Ben Kingsley’s character as the real-life Georges Méliès. This moment occurs when Hugo (Butterfield) and his investigative partner, Isabelle (Moretz), use the heart-shaped key to turn on the automaton robot, which sketches out a scene from A Trip to the Moon. It's a great moment connecting all the key characters in the film, including Hugo, Isabelle, Hugo's father and, of course, Georges. It plunks the film down in something real and tangible rather than the overly processed 3D retro fantasy world. This is when Hugo gets interesting. The rest of the film plays out like an hour-long third act with Hugo and Isabelle plotting to get Georges to acknowledge his place in cinema history. I don't know if children would appreciate the significance of this switch or the real identity of Georges, the grumpy train station vendor. This is magic for adults, the Spielberg kind of magic, and the omniscient hand of God or fate guiding our characters to fulfill their dreams. Scorsese's direction is functional but certainly not of the auteur quality we expect of him. He's a great talent, and thus he's comfortable wearing the skin of a Jeunet or Spielberg. But it's still a disguise for Marty, and it just doesn't feel like his movie. Thus, it’s not a masterpiece. 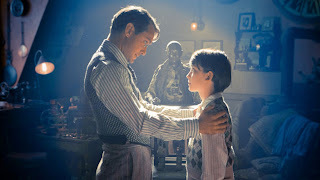 Hugo is available on Blu-ray from Paramount Home Entertainment.